Below are the general guidelines for our 1941 - 1942 impressions. 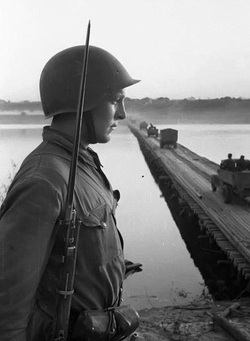 Since the period between the German invasion and early 1943 was a time of crisis and emergency issues, scenario-specific guidelines will be drafted on an event-by-event basis. Many of the items from your base 1943 - 1945 impression can be used for these scenarios. If an item is not specified, please refer to the standard impression guidelines HERE. The M-35 pattern tunic differs from the M-43 tunic in that the standard model has a falling collar and generally has two breast pockets. While there are many variants, the preferred version should have "hidden" buttons on the placket. Collar tabs must be the subdued M-41. The red enamel or subdued rank pips are both accepted for officers and junior command staff..
M-35 pattern breeches are preferred. Both low and high boots are accepted. Low boots should be worn with proper puttees. SSh-40s are preferred but M-36s and SSh-39s are accepted. (NOTE - The IMA reproduction M-36 helmets must be retrofitted with proper liners and chinstraps and repainted to be considered acceptable.). Czech and other "SSh-39 clones" that have been "defarbed" require approval by the command staff to be worn. The all-leather roller buckle belt or canvas and leather belts are accepted. Lend-Lease belts should be avoided. The number of type of ammunition pouches will vary from scenario to scenario. For earlier scenarios, those carrying Mosin-Nagant rifles may be asked to carry two ammunition pouches. Other times, one pouch worn on the right side is preferred. Spare ammunition pouches and/or bandoliers may be called upon for a given scenario. Soviet-style ammunition pouches are preferred. Tsarist-style is acceptable but not encouraged. M-44 pouches are not allowed. Original Soviet or early postwar East German Nagant pouches are highly encouraged! Wartime style. (Covers must have a correct metal button.) The pre-war style with a sling is also accepted. Glass canteens and ersatz covers are encouraged but not required. The shovel carrier must be the cloth version with roller buckle closure on front flap or button style as seen in Soviet Soldier book by Phillippe Rio on page 92. Our usual half cover 2nd generation models are not accepted for early war events. German style all leather covers are not accepted. Normal plashe-palatka shelter half. Worn in a bedroll, packed in myeshok pack, or strapped on the M-36 or 38/40 model packs. Both styles accepted with the pail/pot style preferred. Mess kit covers are optional, but should be worn with the M-36 pack if you have one. Gas mask bag must be the early version with side pockets. Gas mask bags are a required item unless otherwise instructed by the scenario guidelines. All model of M-36, 38, 41 and M-41 "assault" myeshok rucksacks are accepted for 1941 scenarios. For 1942 and later scenarios, myeshoks are preferred. Again, this is general "rule of thumb" and guidelines will be event specific. Bread bags, Y-straps, and bandoleers are optional as they disappear fairly quickly after the German invasion. These should be the last items bought for your early war kit. Padded coats (telogreika) or greatcoats (shinel) are accepted. Greatcoats should have the subdued M-41 collar tabs or no collar insignia. M-40 ushankas are the preferred cold weather headgear. Original or proper reproduction Budionovka caps are accepted but will be subject to inspection by the Command Staff.